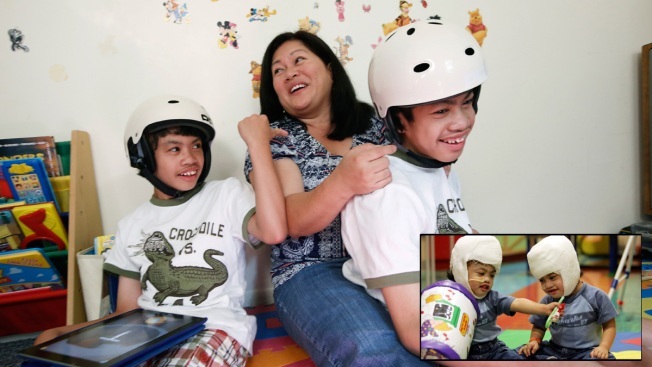 Arlene Aguirre plays with her formerly conjoined twin sons, Clarence, left, and Carl, now 12. On Monday, the family will celebrate the 10th anniversary of the risky surgery that separated the boys (shown in inset). One twin uses an iPad, plays video games and dances to Michael Jackson tunes. The other has significant, possibly permanent, problems walking and talking. The delicate separation 10 years ago of conjoined twins from the Philippines wasn't perfect, but the boys' mother says their very survival is reason enough to celebrate the anniversary. "When they were born, the doctors at home told me, 'You have to choose which one is to live,'" Arlene Aguirre said. "I said, 'I cannot choose that.' The doctors here did not ask me to choose." The boys, now 12, were born joined at the top of their heads, unable to sit up, stand straight, eat normally — or see each other. Once their case was accepted by the Children's Hospital at Montefiore Medical Center in the Bronx, leaving Carl and Clarence conjoined was not an option. "If they hadn't come to us when they did, they would have just withered away and died," said Dr. Robert Marion, the boys' pediatrician, who plans to be at the hospital Monday to mark the separation anniversary. "I am extremely proud of having been a part of this. I'm a little disappointed with some of the outcome but, clearly, to see how these kids have survived and are for the most part thriving, is really wonderful." Montefiore's president and CEO, Dr. Steven Safyer, said, "We are honored to have played a part in helping these boys develop into the unique individuals they are today." The boys were separated on Aug. 4, 2004, in an operation that climaxed a then-unusual "staged separation" that took four surgeries over nine months. When it was over, Dr. David Staffenberg, the boys' plastic surgeon, told the mother, "You're now the mother of two boys." Aguirre, who never left the area after the operation and now raises the boys in Scarsdale, said she throws birthday parties twice a year — on April 21, the day they were born, and on Aug. 4. "The historical treatment was basically to sacrifice one to save the other," said the lead surgeon, Dr. James Goodrich. "The staged separation turned out to be obviously very successful." He and his team have since separated four other sets of joined-at-the-head twins in London, Melbourne and Riyadh. The Aguirre boys shared a "bridge" of brain, 5 or 6 centimeters long, that had to be divided. "When you get beyond 1 centimeter or 2 centimeters, one or both kids takes a hit," Goodrich said. Eventually there was some degeneration of Carl's right parietal lobe, which controls the left side, Goodrich said. Carl suffered seizures, now controlled with medication, and has limited use of his left arm and leg. Carl uses a wheelchair and leg braces, and there's hope he'll eventually be able to walk on his own, though Goodrich doubts there will be a full recovery. As for speech, his mother said he can utter just a word or two at a time, such as "bye" and "thank you." He spends the school day in classes for kids with multiple disabilities and gets occupational, physical and speech therapy. She said Clarence, who can be difficult to understand when he speaks, also gets some special instruction in communication. But unlike Carl, he is an attention-seeking preteen who leaps up to high-five visitors and is quick to show them his favorite video games. "He's kind of a delightful kid," said Marion, who is chief of genetics at the Children's Hospital. "I think he's going to be a typical adult." Clarence shows tenderness toward his quiet twin, and Arlene Aguirre said, "He feels like he's the big brother. He likes to read to Carl, and he's very patient." Both boys still wear helmets to protect their skulls. Goodrich said that once they're fully grown, the skulls will be patched. Arlene Aguirre said, "I did the right thing," when she accepted Montefiore's offer to do the surgery — and absorb the multimillion-dollar cost. And caring for her sons alone — she's a single mother — is getting easier as the boys grow up in their white house behind a picket fence off a busy road. She has a support network of friends who come over on weekends to stay with the boys while she buys groceries and runs errands. With Montefiore's support, the family lives in the U.S. on a medical visa. They have not been back to their hometown of Salay in the Philippines — and Arlene Aguirre said she misses her family. She hopes that she and her sons can eventually become American citizens. "The boys are Americans, really," she said. "They don't want my Filipino food. 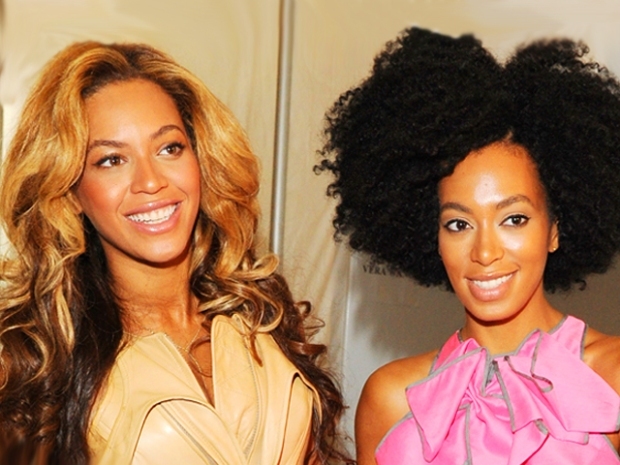 They like spaghetti, mashed potatoes — and McDonald's, of course."